I have never been known for throwing things away that may still have some useful life left in them. My parents, who had lived through WWII, had the motto, ‘Make do and mend’, and I am proud to say that I have taken up the banner! Take for example my laundry basket… I bought it when I got married; a good, solid, fashionably brown, plastic basket. Not only has it served me well transporting my wet washing to the washing line and the dry washing back indoors and storing it until it got ironed, but it has also served as a plaything for my four children. All of them have had enormous fun sitting inside it as toddlers and being picked up and carried around in it. It has been used as a cage and a carriage for make-believe and been filled and emptied of all sorts of strange collections. So, I suppose, it is not surprising that over the last couple of years the handles have been breaking off – and now are finally gone. And – when I say that my youngest child started at University last year and my oldest celebrates her 27th birthday next month – I guess you could be excused for thinking that the time has come for me to buy a new laundry basket! But no…there are many more years of usefulness in it yet! A couple of weeks ago I discovered a book on knot making in a Charity Shop and bought it because I thought some of the knots illustrated could be used in jewellery making…but looking through it this morning I realised that it held the key to rejuvenating my laundry basket!! One of the knots – a Braid Knot – seemed to fit the bill, especially when it said that it could be used to replace a broken handle on a suitcase! Why not fix a broken handle on a laundry basket?? Using a spool of hemp garden twine I plaited three lengths together to make it a little thicker. I then went on to create a Braid Knot – which basically is a three strand plait which is executed in the middle of a single length of cord – all very clever stuff! It meant that I had a thick, braided ‘handle’ and a thinner cord either end for attaching it to the laundry basket. 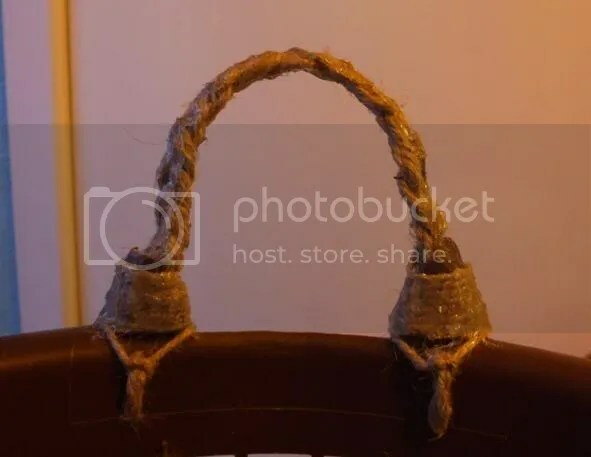 Just to finish them off and make them more secure, I have bound the ends of the braid handles to the remaining stumps of the old basket handles and then ‘massaged in’ a trail of hot glue gun glue into the braid to make it stiffer and more wear and tear resistant! I’m quite happy with the results – more functional than beautiful – and I’m not sure my repair will make the basket last another 29 years! – but it makes me smile!! And I’m sure my parents would be very impressed with my resourcefulness! !